Can’t say I’m nuts about Christmas music. That’s one thing I just never felt compelled to spend money on. But ’tis the season and all, so let me spread some holiday cheer with a little listening party. And I wanna keep it going in the comments section. If you have some truly funky and/or unique Christmas songs to recommend, please let me know. I’ll stream some of them on my Vox blog. One of my readers – blaark by name – turned me on last month to Lisa Kekaula, lead singer of a rock band called the BellRays. Then I found this cut. The BellRays came with the hard funk on this one. Not the world’s greatest song by any stretch. But there’s something historically significant about “Little Christmas Tree.” It is (to my knowledge) the only Christmas song ever written by George Clinton! He wrote it back in the ’60s, when he was trying to make it as a songwriter for Motown. This novelty tune was released a few years ago by Frankie Ford, the pride of Gretna, Louisiana. Ford made one hit record, “Sea Cruise,” and that was in 1959. He has been performing ever since. Alcoholics should find this reworking of “The Twelve Days of Christmas” very amusing. This 1983 recording – more than 18 minutes long – is by Oliver de Coque, a superstar of highlife music. De Coque died earlier this year. 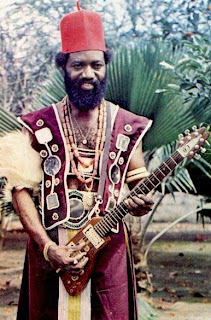 Being that he sings in the Igbo language, I can’t understand what de Coque is saying... except for the words “Jesu” and “Kristi.” But his guitar playing is superb. Glad you enjoy the de Coque song. As my wife explained to me some time ago, it's an account of the Nativity story. She didn't really have time to sit down and give me a more literal translation, and I wanted to put the song online in time for Christmas. ^ Oh, I did, blaark. I started there and moved on to the BellRays. John B., thanks for sharing so much music and knowledge. - "Papa Noel," Brenda Lee. Believe it or not, a great New Orleans vibe on this one. - "There's Trouble Brewin'," Jack Scott. Could have been Elvis singing this one. - "Merry Christmas," The Cameos. Some great doo-wop Christmas stuff. - "Purple Snowflakes," Marvin Gaye. Awesome. I'm not into Xmas music that much, but recently I purchased "Ultra-Lounge: Best of Christmas Cocktails" mainly because I LOVE lounge (and the ultra-lounge series), and secondly because the songs are classics. I think my favorite Christmas song is Donnie Hathaway's "This Christmas." Too many years of retail hell,have given me a aversion to the music that goes with a holiday I'm not big on either. If they would rather die,they had better do it, and decrease the surplus population. That said,if I am going to listen to Christmas standards,I'm going out with a Go-Go beat! From '99 and featuring Eva Cassidy on two tracks. Really nice arrangements and a cover of Donny Hathaway's "This Christmas"
Sorry,don't know where to find the full clips. And no I didn't buy a CD! A thoughtful gift from someone,trying to Un-Grinch me by using my weakness for all things Funky. ^ Well done, Bill. Here's Chuck Brown & Eva Cassidy doing "The Christmas Song"... BAM! Thanks for the Red Sovine, Schottzie03. This is an American masterpiece... BAM! What? No Bootsy Collins and "Christmas is 4 Ever"? ^ Believe it or not, I didn't even know about that album! Thanks, mate. Click here to hear "Winterfunkyland." UBM, sorry to hear that. I even have my 7-year-old asking for Rudolph the funky nose reindeer. Did you ever see the Santastic mashups? Jingle Jane -- combine Smokey Robinson and the Velvet Undeground -- has become one of my holiday favorites. Loving all these clever and obscure Christmas songs mentioned by everyone. Unlike our host, I LOVE Christmas albums and buy a few every year. The greatest of all has to be A CHARLIE BROWN CHRISTMAS, which track for track is as good as anything ever, but for more modern stuff I would reccomend the TAKE 6 album HE IS CHRISTMAS. I also have a deeper appreciation of the James Brown Christmas album every year. PRAYER FOR PEACE is a ferociously funky jam. Hey Reg. Only in recent years, as I've gotten deep into jazz, did I truly appreciate what Vince Guaraldi was about. Excellent choice, UBM! Like you, my appreciation of Vince's work deepened as I got older. I love creative work that appeals to you as a kid but reveals a more profound side as you get older. Like ROCKY AND BULLWINKLE, SPONGEBOB and P.Funk. I would highly reccomend a live album released a few years ago with Guaraldi doing the Peanuts classic songs. Like bklyn6, I did those Lounge remix albums of Christmas songs...Verve just released one this year that was nice. Did PURPLE SNOWFLAKES inspire PURPLE RAIN?